cannot see it. I am not sure if the artists are conscious of this, but I know of some examples. So, in the case of art, the trick for the observer is to resist the rhetoric surrounding the image or picture and look at what is in front of us—to actually see the thing as it is. ort to think about the ideas that can we see the reality before us. Thou art Peter, and it is upon this rock that I will build my church” (Mt 16:18, Fr. Knox translation). e writer of the hymn is not trying to deceive us. But as Catholics we can get caught up in the sentiment and read between the lines, re-interpreting the plain words of the hymn in an orthodox manner as if the words were only symbolic. But the author of the hymn made it clear he did not accept the Papacy; he was a true artist. e answer is nothing, unless one reads between the lines. This we do as we are carried along by the delightful melody (and it is delightful) and the religious sounding words. But, except for one line of verse three, this song could just as easily be sung by a gathering of organic bread makers. So what is the musician saying? The plain sense of the hymnist’s words is that the Eucharist is symbolic. Which is by way of introducing another artistic accomplishment. 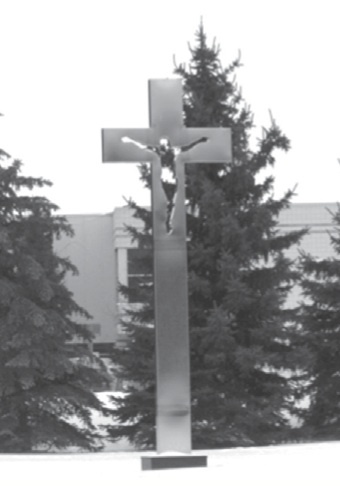 I was driving through Peterborough, Ontario, when I saw on the front lawn of the Catholic School Board a huge aluminum cross with a cut out area where the Corpus is normally placed. It looks like a crucifix but, with the genius of an artist, the sculptor (I do not know who it was) managed to capture the reality of the modern Canadian Catholic Church and its Catholic school system, at least in Ontario. For consider what the sculpture is saying. Rather than a cross of wood, like the real one, with a statue in bronze or wood of Our Lord crucified, we are presented with a modern cross of aluminum: a nice shiny modern industrial cross for a nice shiny modern industrial church. And where Our Lord should be is a giant, perfectly formed hole. How appropriate: a hole where Our Lord was, for a school system that has excelled in everything except passing along the faith. I know that some will argue I am being unfair, that the hole where Our Lord should be is actually now filled with light so we can see through it. Sure, look at it that way—it’s kind of like how churches are more full than ever now that nobody goes, or how Catholic education is so successful even though its students no longer believe. Personally, I think the artist knew something about his business when he made an aluminum cross with a hole in it as the symbol of the Catholic School Board.